The VAR statement indicates that the time variable is being studied, while the H0= option specifies that the mean of the time variable should be compared to the null value 80 rather than the default of 0. The PLOTS (SHOWH0 ) option requests that this null value be displayed on all relevant graphs. The SIDES= U option reflects the focus of the research question, namely whether the mean court case length is greater than 80 days, rather than different than 80 days (in which case you would use the default SIDES= 2 option). The ALPHA= 0.1 option requests 90% confidence intervals rather than the default 95% confidence intervals. The output is displayed in Figure 106.1. Summary statistics appear at the top of the output. The sample size (N), mean, standard deviation, and standard error are displayed with the minimum and maximum values of the time variable. The 90% confidence limits for the mean and standard deviation are shown next. Due to the SIDES= U option, the interval for the mean is an upper one-sided interval with a finite lower bound (84.1659 days). The limits for the standard deviation are the equal-tailed variety, per the default CI= EQUAL option in the PROC TTEST statement. At the bottom of the output are the degrees of freedom, t statistic value, and p-value for the t test. At the 10% level, this test indicates that the mean length of the court cases is significantly greater than from 80 days (t = 2.30, p = 0.0164). 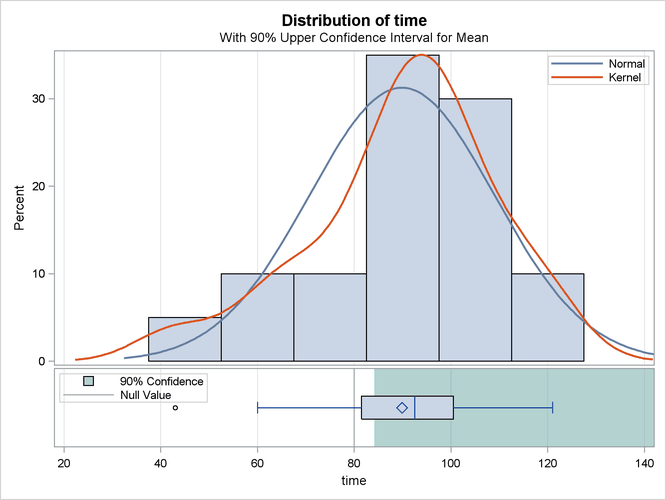 The summary panel in Figure 106.2 shows a histogram with overlaid normal and kernel densities, a box plot, the 90% confidence interval for the mean, and the null value of 80 days. The confidence interval excludes the null value, consistent with the rejection of the null hypothesis at = 0.1. 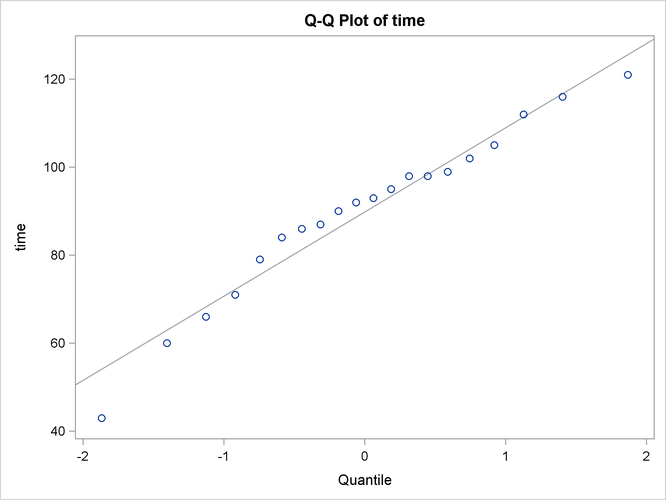 The Q-Q plot in Figure 106.3 assesses the normality assumption. The curvilinear shape of the Q-Q plot suggests a possible slight deviation from normality. You could use the UNIVARIATE procedure with the NORMAL option to numerically check the normality assumptions.